A European power station operates two coal fired units each of 540 MW which originally ran on natural gas and heavy fuel oil. Subsequent upgrades included converted to pulverised coal firing and each now burns about one million tones per annum. The change to coal firing increased the risk of erosion of the boiler tubes by fly ash carried in the high velocity flue gas stream. Because of the risk of undetected leaks adversely affecting efficiency, causing reduced availability, a decision was made to install a tube leak detection system. Early detection of leaks and prompt repair minimises heavy penalties for non-availability which can be as high as US$160,000 per day that the station is unable to supply electricity. An acoustic leak detection system was chosen for supply from Lintvalve, represented by Ultra-Dynamics, with both boilers equipped with the Lintvalve system. Prior to the systems being installed, a leak was detected on boiler number 2 sometime after it originated. Operating staff heard the telltale sound but not before the leak had caused severe damage to a header. The original wall thickness of 45mm was eroded to only 5mm. This expensive discovery confirmed the necessity for an installed detection system. An acoustic leak detector comprises sensors (microphones or vibration detectors) and signal processing electronics which filter out all but the sound or vibration caused by steam leakage. The sensors are mounted on the side of the boiler at strategic locations. The Lintvalve system supplied was a fully expandable hardware system with bar graphs and mimic showing sensor locations and alarm status with sensors located in the radiant part of the furnace and the second pass; areas considered by the operators to be the most likely to suffer fly ash erosion. Towards the end of one afternoon shift, the detector alarm on boiler number 2 sounded and alerted operating staff. Two of the systems channels were showing increasing decibel levels which indicated a leak somewhere in the second pass section in the area of the LT-superheater banks. It is significant to note that no visual or audible signs of leakage were revealed by a manual inspection. Confidence in the capability of the Lintvalve system to detect extremely small leaks prompted the operators to take the boiler off line. Confirmation that a leak did in fact exist was provided by the falling signal level as the boiler cooled and the steam pressure reduced. Even with the boiler opened, the initial visual inspection found nothing, however, an eroded area on one tube of the backwall of the second pass led to the discovery of a pinhole leak in the bend of one of the LT-superheater tubes. The damage had been caused by fly ash erosion. Even this small hole had already started to cause some secondary damage to the second pass backwall tubing. The leaking tube was removed and replaced and the eroded backwall was also repaired. To help to protect the tubes from further erosion, protective shields were fitted. The repair was completed in five days, taken from the moment of taking the boiler off line to the time that the boiler was on-line again and the generator was re-connected to the grid. On the basis of previous experience, the repair time taken with no leak detection system fitted was conservatively estimated at about eight days. 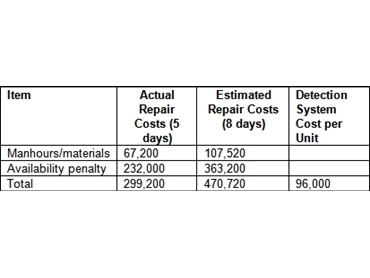 It can be seen from the table below that the early detection and rectification of the leak, which would not have been detected until much later by conventional methods, has resulted in a huge saving in the otherwise very costly penalty, in addition to the reduced repair costs.